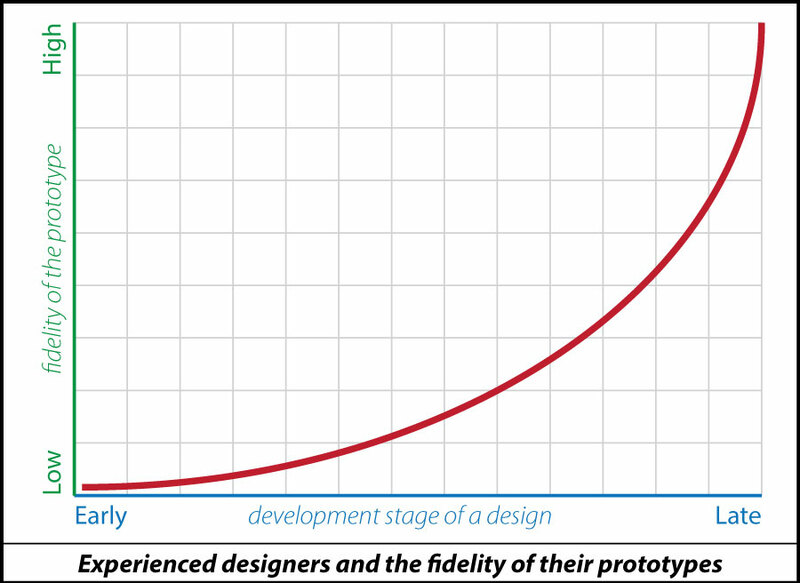 Last week I wrote a post about the fidelity level of design prototypes. This topic has been on my mind for some time. Shortly after making last weeks post I created another graph that I think is noteworthy. Much like last weeks graph/post I have no quantitative research to back this up. 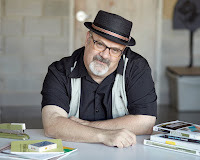 I have been studying design and designers for a couple of decades now and these two posts reflect my personal experiences. 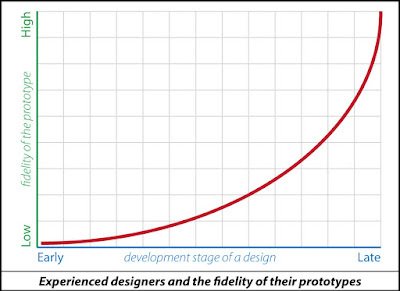 Today's graph reflects how an experienced designer might create prototypes of increasingly high fidelity as a design project progress from its early stages to it later/final(? )/ship state. As with last weeks post this progression may depend on the type of design project that a designer might be working on and the client that the designer is working with. Sometimes it might be appropriate to create prototypes at a very high level of fidelity much earlier in the design process. So, these graphs are intended as rough "rule of thumb" models. I'm working on a paper that discusses low-fidelity, rapid prototyping for user-experience design. I have an interest in paper prototyping — why it's useful and important. Low-fidelity, rapid prototyping is any quick, rough way of approximating how a design will look and/or function. This is often done just with paper and markers. But it may be done with other common materials that might be found around the office -- paper, markers, tape, glue, rubber-bands, paper-clips, etc. I also have an interest in affordances. An affordance is "a property in which the physical (or arguably visual) characteristics of an object or environment influence function." For example when you see a large wooden rectangle embedded in a wall and there is a metal knob at waist height on that rectangle -- you assume that's a door. You can assume that by twisting and pulling the knob you can open the "door." A door knob is an affordance that indicates there are certain things you can do. So it occurred to me today that these two interests work well together. Of course it is one of those seemingly obvious connections. We do pencil sketches on paper because they are easy to change and easy to change quickly. The low-fidelity of the materials of pencil and paper afford us the ability to change our sketches. 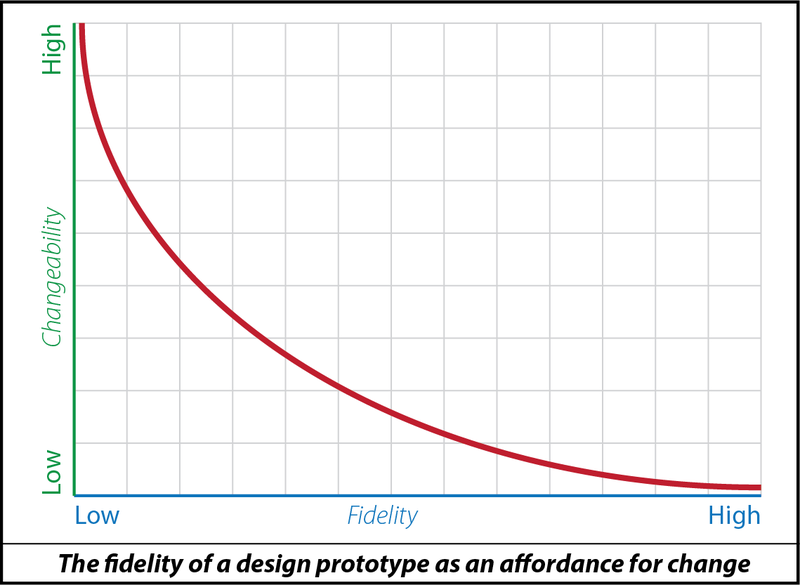 As the fidelity of a prototype becomes higher it becomes increasingly difficult to change. A low-fidelity prototype of an iPhone app may be done with several post-it notes stuck to the screen of the phone. Drawn on the post-it notes are a series of screens that represent how the app looks and functions. Peeling off one post-it note after another gives an approximate experience for using the app. Changes to such a prototype can be done in seconds. As the prototype is slowly evolved by the designer the prototyping moves from pencil on paper to digital wireframes and beyond. As the prototypes increase in fidelity it becomes increasingly difficult and time consuming to make changes. There is enormous value in using low-fidelity prototyping in the early stages of a design project. The low-fidelity of the prototype affords the designer the ability to make changes easily, quickly and very inexpensively. 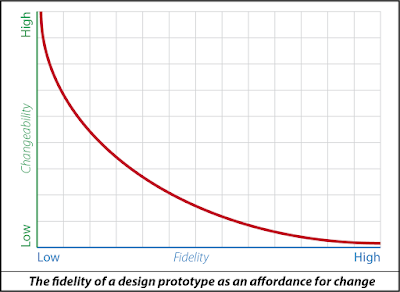 The fidelity level of a prototype acts as an affordance -- low-fidelity acts as an affordance for a high degree of changeability and high-fidelity acts as an affordance for a low degree of changeability.